In a clear and easy way to follow, the author describes the characteristics of postmodernity. He reaches the conclusion that postmodern people love stories and therefore, Jesus' parables provide a window of truth for postmoderns. In an excellent and theologically well informed piece of writing he provides a definition of parable, deals with the relation of Jesus' parables with the Hebrew tradition, the purpose of the parable, characteristics of the parables of Jesus, interpretation of the parables for preaching, the steps to follow in developing a homiletical text, and offers a sample of how parables could be preached in a postmodern age. This systematic treatment of preaching parables in a contemporary context is followed by an exegetical, hermeneutical and homiletical explanation of ten parables giving guidelines for preachers on how to preach these parables. In this explanation of each parable the following issues are discussed: the specific parable's unique preaching window to postmoderns; the position of the parable within the text; word study; cultural factors; exegetical outline; homiletical outline; the big idea in the parable; material in order of the text; and guidelines for homiletical consideration. 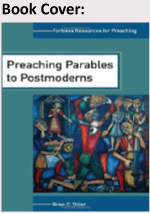 In the last part of the book, the author provides the reader with four written sermons as examples of his approach to preaching Jesus' parables to postmoderns. The book is well written and the author is clearly well versed in theology and in the practice of preaching. Reading this book will be rewarding for both homileticians and preachers.